ReThink before the damage is done! Together, we can conquer cyberbullying.! Online hate is stopped. Lives are saved! Research shows that when adolescents are alerted to "ReThink" their decision, they change their minds 93% of the time. Using ReThink™, the overall willingness of an adolescent to post an offensive message reduced from 71% to 4%. Cyberbullying is a serious issue that is affecting millions of teenagers around the globe. Cyberbullying occurs when an individual use social media or other technology platforms to intentionally abuse another individual. There are 1.8 billion teens around the globe, and technology is in the hands of every adolescent. Research shows that adolescents may act on impulse and post mean, hurtful, embarrassing messages online that they may regret later. Victims suffer from depression, anxiety, low selfesteem and are more likely to drop out of school. Conventional solutions address bullying after the damage is done. 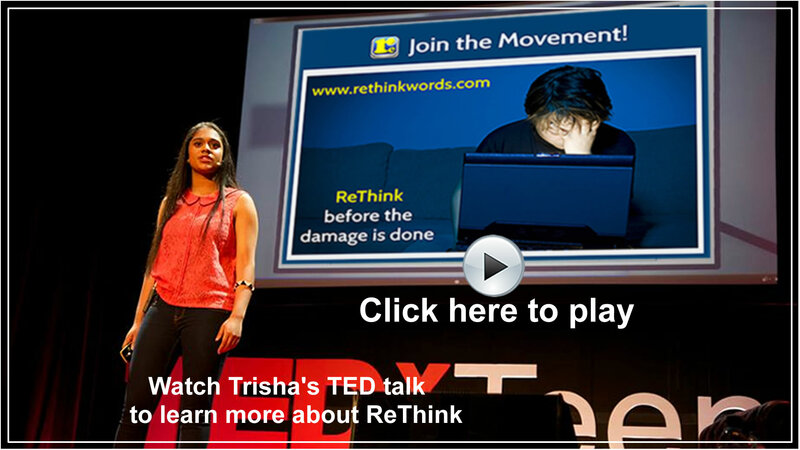 ReThink empowers adolescents by giving them a second chance to rethink before posting anything hurtful online. Research has found that over 80% of teens use a phone or cellphone, making it a very common form of communication. Furthermore, 52% of adolescents have experienced some form of cyberbullying, and 38% of those individuals experience suicidal tendencies. Over 25% of adolescents have experienced repeated cyberbullying - a scary figure. Finally, research has found that the scars of bullying and cyberbullying can last decades into the future, making it even more clear why we must tackle this issue at the source - before the damage is done. When cyberbullying occurs, children are often advised to block the bully and tell a parent or guardian. Research has found that 9 out of 10 children suffer in silence - they do not tell anyone. Cyberbullied victims suffer from depression, anxiety, low self-esteem, and more likely to drop out of school. Several solutions that are in place today address bullying after the damage is done. ReThink is the first ever solution to proactively prevent cyberbullying before the damage is done. ReThink stops cyberbullying at the root of this issue, before hurtful messages go out on the internet. Let’s end online hate before the damage is done. The ReThink App is available for free, in both the iOS App Store and the Google Play Store. Download it today! ReThink Chapters serve as local centers of digital awareness and activity on high school campuses across the nation.